After you have installed and activated Divi Monk Templates plugin, you will be automatically redirected to the License Activation Page. 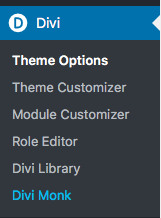 If you aren’t automatically redirected then you can go to WP admin > Divi > Divi Monk. On this page, you will be asked to enter the License Key and click the “Activate License” button. Once the license is activated, you will be able to access all the Templates.